A former regional journalist known for expressing “lively and outspoken views” in his opinion column has died after a cancer battle aged 71. 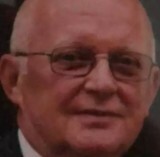 Tributes have been paid to Ian Pilkington, who worked for the Burnley Express, Rossendale Free Press and Lancashire Telegraph over the course of his career. Ian, pictured, died at the Royal Blackburn Hospital with his wife and daughter by his side. An obituary in the Express described him as a “popular and well-known figure in local media circles” who was particularly well-known for his ‘Straight Talking’ column in the newspaper. His daughter Nicola Johnstone told the Express: “Dad was a stickler for grammar and punctuation. In his younger years he enjoyed a drink with colleagues and was once nominated for journalist of the year. Ian grew up in Stacksteads, Lancashire, and lived in Padiham, near Burnley. His funeral will be held at Burnley Crematorium tomorrow at 10am, followed by a wake at the Hapton Inn, in nearby Hapton.